This retreat is designed to nurture the hearts of women whose husbands serve in ministry. 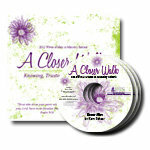 This year's theme isA Closer Walk: Knowing, Trusting, and Seeking God. Learn from speaker, counselor, and ministry wife Kerry Scheer as she walks through Psalm 9:10 - "Those who know your name will trust in you, for you, Lord, have never forsaken those who seek you." Kerry Scheer is a passionate speaker who enjoys teaching women how to know and follow hard after God. Kerry graduated from the University of North Texas with a Master’s degree in Counseling. She counseled in a school setting as well as in a private practice before retiring to be a full time mom to her three sons. Kerry lives in Denton, Texas, with her husband Mike, who is the Missions Pastor at Denton Bible Church. This message is one part of the entire series.